1) Chop onion, pour with vinegar and water in proportion 1:1. 2) Dice or cut cabbage in strips. Dice chicken breast and add to cabbage. Cut cucumbers and add to chicken. Drain liquid from onion and combine all the ingredients, salt, pepper and dress with mayonnaise. Stir it. 3)Decorate salad as you wish. 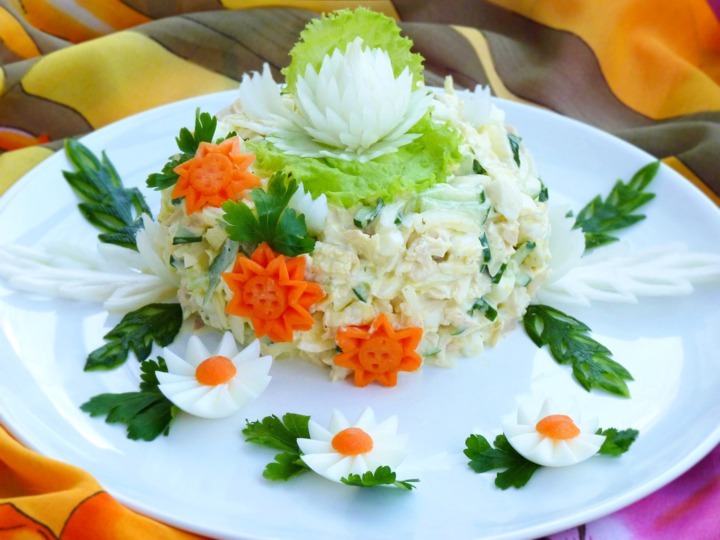 Make flowers from carrot, onion and eggs, leaves – from cucumber and lettuce. Top of recipe "Spring salad “Monika”"
Ухти! Як ви таку красу навирізали? Красива презентація салату довго така краса вирізається?